Event Planning - "The Order"
If you are in the beginning stages of planning your wedding you may feel overwhelmed not knowing what to do first. I will take you through the basic steps in the order that I believe it is best for your budget and sanity. Diving into it, the first step is determining your budget. If you haven't read my "Budget" entry stop reading this, and read that first. It is without a doubt the most important step to complete before moving forward. I know a lot of people that skip this step and the remainder of their engagement is full of stress and worry. Your date - Yes, this is a "DUH" I know, but your date is the first exciting step/commitment in the planning process! The weather and attire - Your venue, determines your date, your date determines the probable weather, which will also determine the attire for you and your guests. The location - Where your venue is located will determine if your wedding will be local or a destination wedding. For a local wedding getting the word out to guests is a little more lax but with a destination wedding you will need to pay attention to your engagement timeline more closely to be sure you give guests enough time to save the date and rsvp. In addition, you will need to book out vendors further in advance since you don't live local to the venue you will need book sooner rather than later. Overall style and theme - Your venue will come with a certain feel and style which will influence your decor and linen choices. The wedding dress - The venue believe it or not will help determine what type of dress you buy because it will need to go along with your style and theme. Your colors - The colors that you choose for your tabletop and florals will be determined by the venue and what surrounds it. For example, if you choose to book a winery your colors are going to look different from a wedding that is in the city. The amount of guests that can attend - There are maximums at any venue that you book. If you choose a location that can only hold 100 guests that is going to determine your guest list, amount of invites, postage, rentals, food, and drink. Basically 85% of your budget! Now that you have set a date and picked your venue you can now start looking for a wedding coordinator. Even if it isn't me (wink), you will still need at least a day of coordinator. If you haven't read my "Hire a Professional" entry stop reading this and read that first. A huge mistake a lot of brides make is to try to save a little bit of money and have a family member or friend coordinate details the day of the wedding. HUGE mistake. Find a trusted planner, look at your venue's preferred vendor list, and go online. Be sure you find the right coordinator that comes highly recommended and fits in your budget. Now that you have your set budget, your venue, your wedding date, and your coordinator in place you can start dress shopping!! Be sure to consider your ENTIRE budget minus everything already booked and go into bridal boutiques with a set budget. Only have them bring dresses that are at or below your wedding dress budget. It's helpful to have a running expenses sheet so you can see how fast your spending grows. After you've picked the dress everything else will start to fall into place. From here the order is not as strict. Start by booking your graphic artist so they can start on your save the dates right away. Then book your caterer, cake designer, and bartender (if the venue doesn't come with one) based on your estimated guest count. After you have them booked start the floor plan for the ceremony and reception. 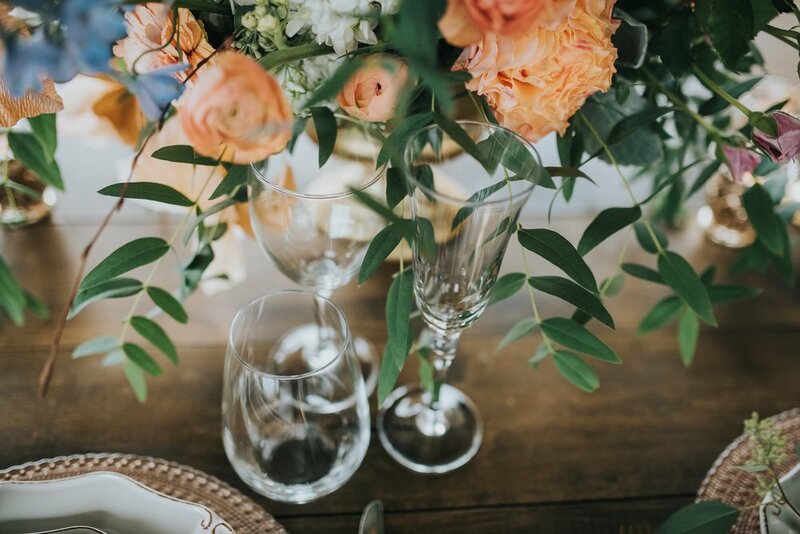 This will determine your rental order, and once you have your rentals and seating configurations you can then book your florist to order necessary (and unnecessary) arrangements. After those larger things are set you can start thinking of the smaller details. The fun stuff! Favors, signage, guest book, card box, guest entertainment, etc. The cute personal touches that will make your wedding personalized to you as a couple. A lot goes into pulling a wedding together. Try not to get overwhelmed, just take it one step at a time and have fun with it!